Here is the dye lab in Boulder at The Dye Works, with Gail and Donna where I learned all about cochineal dyeing. Over 100 shades of red were produced in a cochineal dye workshop over 2 days at The Dye Works in Boulder, Colorado. 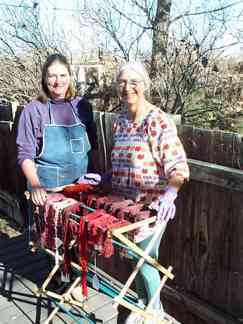 I hired the 2 owners to teach me as much as possible about cochineal dyeing during 2 very full days. I had pre-mordanted my mini-skeins of 3 varieties of natural color beige Navajo yarns, some plied, with alum prior to arriving. Reds were produced using various adjutants beyond the initial alum mordanting. Some of these were iron, tin, tartaric acid, fustic, cutch, pH changes. I also learned how to use several other natural red dyes: lac, logwood, madder, and brazilwood. Some skeins were overdyed with indigo to obtain some "blued" reds too. The Dye Works is a super resource for folks like me who need to know how to use these natural dyes for their textile restoration work. I also brought home a full dye kitchen of chemicals and dyes, being able to purchase the materials there. Here is the first of the wool I dyed at The Dye Works going into a blanket being repaired. Thanks for sending the Ashtlo newsletter. On Saturday, I drove down to Sara's hogan at Table Mesa to meet Roy there at a Navajo Spin Off. Several folks were gathering to spin yarn from fleece, to card it, etc. About 8 folks were there when I arrived about 10 am then Roy showed up about 20 minutes later. I was heading to Toadlena Trading Post that morning so was able to meet Roy at Sara's then we both went down to Toadlena to see the sandpainting rug exhibit. Also we followed another great male weaver Jason and the young medicine man who is fhe fiance of Sara's daughter Totanabah. The four of us spent a good hour talking about the rugs in the Toadlena Museum. The medicine man is maybe only in his 30s but super knowledgeble and attends ceremonies almost every day somewhere on the rez. We all drove back to Sara's then and I dropped off Roy as I had business then in Shiprock. 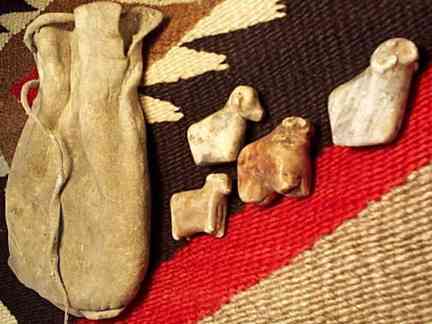 Here is a photo attached of very old Navajo sheep fetish stones a spiritual friend gave me. The four of us discussed these stones on Saturday at Toadlena outside, as we were getting ready to drive back to Sara's. It was warm for there, in the 50s, with no wind so very nice. These stones are kept in the pollen bag by the owner as good luck and prosperity as these are the sheep of the Four Directions, of course! They are genuine spiritual ethnographic fethishes. The bag is their home and has pollen embedded inside it. 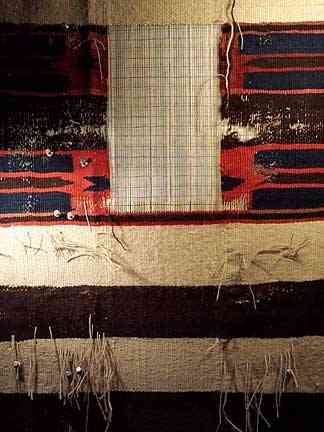 This came from a Navajo man in Mexico via a Yaqui Medicine Man then to a Lakota Medicine Guy then to me for now. I was in boulder colorado last Monday Tuesday where I hired the two owners of The Dye Works there to teach me cochineal dyeing. We got a lot done and I learned tons, took home over 100 shades of red dyed onto my skeins preprepared for the workshop. I stayed with my friend from grad school who happens to live 3 miles from The Dye Works! He is the Lakota Medicine Guy above mentioned, one of my best friends for some 30 years now as we both got our Master's in Tibetan Language at Indiana U in the early 70s.